I recently did a huge makeover of the challenge, with better, brighter color-schemes (two fun choices now! ), updated fonts, and overall better organization. And even more recently, I added several pages of accountability and extension ideas to give you even more options and flexibility. I've never really blogged about Tower of Books, but with the recent updates, I thought it would be a good time to create a post that explains them and answers several of the most common questions I receive regarding the resource. 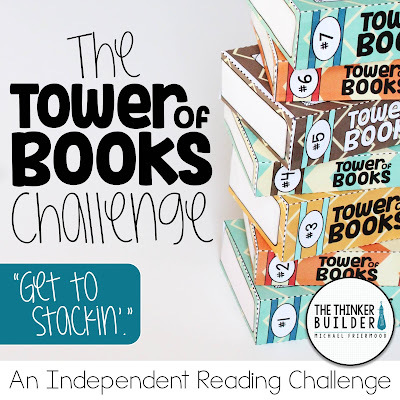 What IS the Tower of Books Challenge? 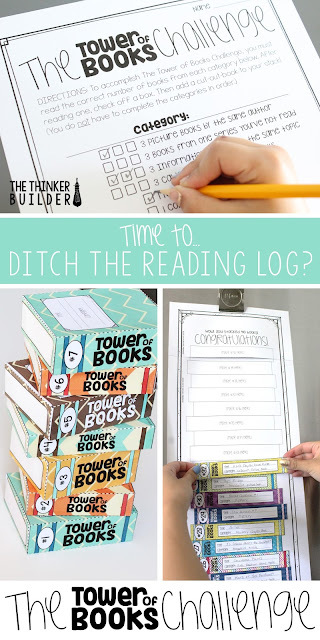 The Tower of Books Challenge is based on two core ideas: to widen students' reading choices and to provide a fresh and motivating way to keep track of what they read. Students are given a reading list with numerous genres and categories of books they must read to meet the challenge. 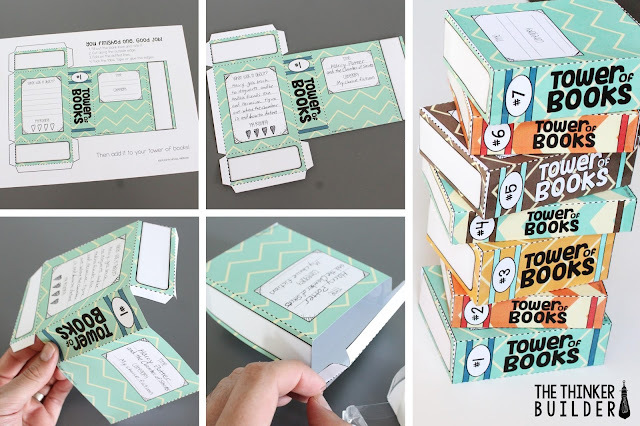 For each book students read, they create a book cut-out from the printable files, fill in their book information, and begin forming their… Tower of Books! Lots of different category lists are are included to help you suit the challenge to your students, as well as parent letters, a reader pledge and other activities to help with accountability, and even "Master Stacker" award certificates. Michael, there are so many options. Can you walk me through the decisions I need to make to get this thing up and running? Choose a 20, 30, or 40 book challenge. How many books do you want your students to read? Think about the age of your students and the time frame you have in mind. Choose a category list. Students will read books that fit into each category on the list you choose. There are nine different lists, each one varying in genre, book type, and quirkiness, and each one comes in all three amounts (20, 30, and 40 books). And there's an editable category list too, in case you want to customize a list even more. Choose a format for how students will keep track of the books they read. 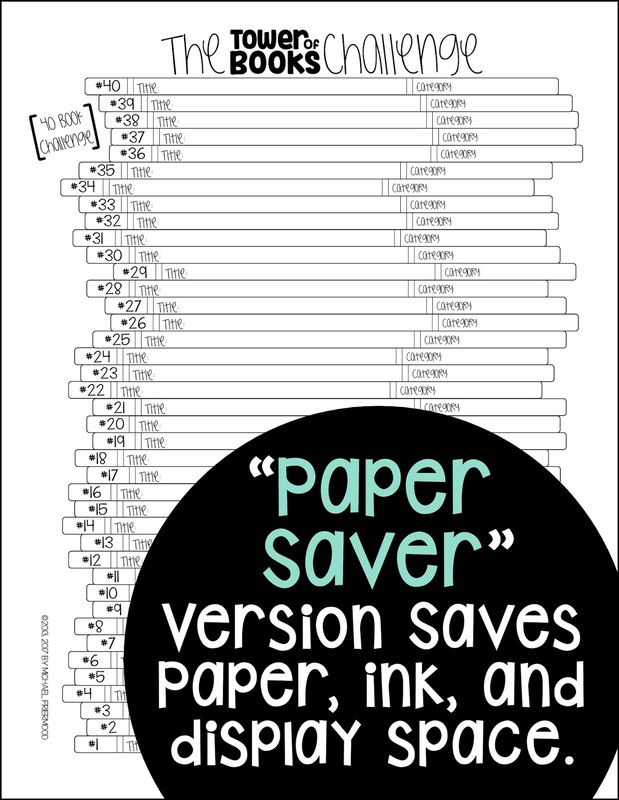 You can do the two-dimensional version or three-dimensional version, or there's even a "paper saver" version where everything's recorded onto one sheet of paper. Whether you do the 2-D or 3-D version, you get to pick which color scheme you prefer: a retro chevron theme or a bright colors theme, or save some ink and use the blackline version. Michael, I love the idea of the Tower of Books Challenge but I don't think I have the space to display it all. What suggestions do you have? For 2D towers kept at school, an easy solution to not having enough display space is to simply not display the towers. Instead, have students keep their tower mats rolled up like a scroll. 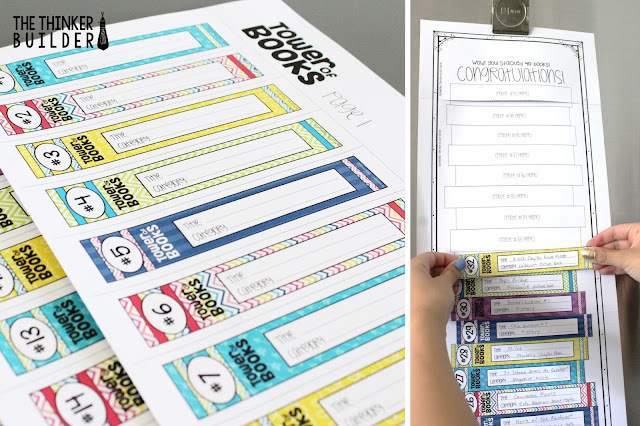 When students need to add another book spine to their tower, they simply unroll their scroll. But if you are looking for space to display the tower mats, consider using the hallway, which often has miles of unused space. Still, I'm not sure any place beats hanging the tower mat on the refrigerator at home. For 3D towers kept school, consider using window sills, tops of book cases, or that often unused floor space underneath your whiteboard. It might not take long for towers to start falling over, so consider having students add a bubble of tape in between each book prism. You also might consider asking your media specialist if you can stack towers on top of book cases in the school library. If none of those options will do the trick, consider using the Paper Saver version of the challenge, which condenses the 2D tower mat onto one sheet of paper. It's obviously not as dramatic of a way to track students' reading but the practical trade-off might be necessary. One strategy that makes a lot of sense is to use one of the original tower methods for the first Tower of Books Challenge that you do with your class, but then with future challenges, use the Paper Saver version of tracking. Changing the category list for these future challenges keeps them fresh and student engagement high. Michael, does Tower of Books have to be an independent challenge? Whole Class Record: Many teachers have used Tower of Books to keep track of all the books read aloud in class. Whether novels, mentor text picture books, or even basal stories, using Tower of Books in this way is a fun way to see all the reading the class has done together as well as the wide array of genres, too! Class vs. Class: If multiple classes have a license for the Tower of Books, try a friendly class vs. class competition, or even a challenge between the whole grade level! Small Group Teams: My favorite spinoff for Tower of Books is to form small group teams with about 2-4 students per team, where each team works together to complete the challenge. It's a great way to incorporate some interpersonal skills, hold each other accountable, AND it really cuts down on the materials needed. Michael, I worry about accountability. How can I ensure students are really doing the reading? Holding students accountable for actually reading the books for the challenge can be tricky. As with anything, the more accountability measures you take, the more risk you have of decreasing student excitement and increasing your own workload. So, try to strike a balance so students are still motivated to read and complete the challenge, but do so with integrity. I've added several pages to the Tower of Books resource to help give you ideas for more accountability. One of the simplest is a "Reader Pledge" that you can have students sign prior to starting the challenge. 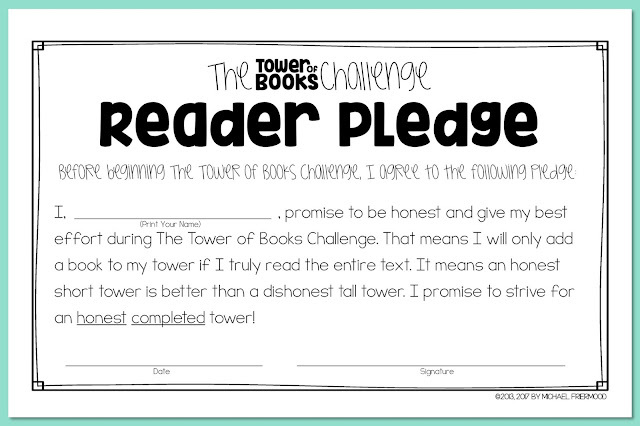 I like how the pledge makes clear that "an honest short tower is better than a dishonest tall tower." Of course, this may not suddenly make someone honest. As Taylor Swift says, fakers gonna fake. But at least this pledge lays out the foundation for what's important. 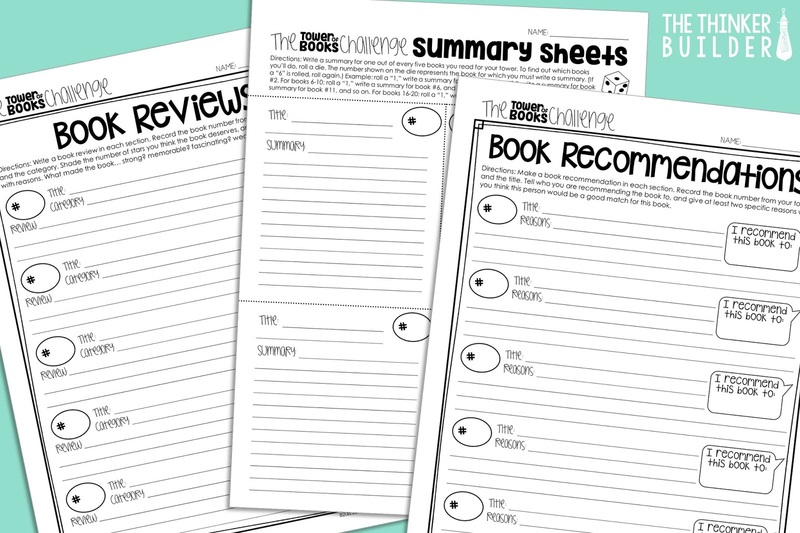 Once the challenge has started, try choosing a couple of the new activity sheets to help hold students accountable for reading the whole book. 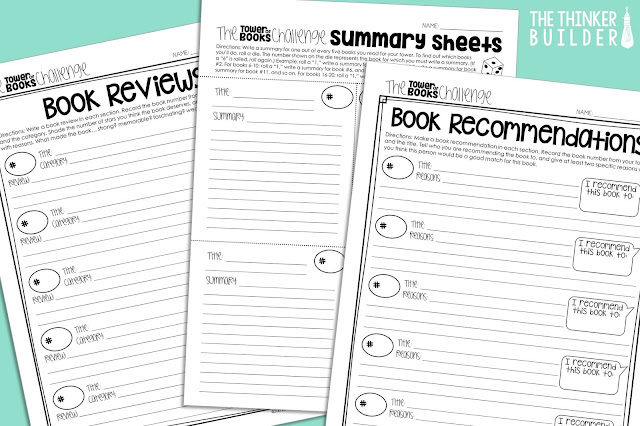 These pages include summary sheets, book reviews, and book recommendations. Now, if it's me, I would not want to require students to write a full-on summary for every book they read for the challenge. The motivation factor can really start to dwindle after a week or so. Plus, who wants to check all those summaries? Not me. I know what you're thinking... If I only require students to write summaries for certain books, then they'll just make sure to read those books only. Here's the trick: you require a certain number of summaries (or reviews, or recommendations, or a combination) for the books read in the challenge, BUT, you don't tell them which books they'll do summaries for until after they've added them to their towers. For example, you tell students, "Boys and girls, after you have five books in your tower, I'll tell you for which one of those five books you need to write a summary. So be sure you've really read all five books so you are prepared." One way to do this is to roll a die after every five books to determine which of the five books students must summarize. If a two is rolled, students summarize the second book in their tower, and so on. Or for every ten books, flip a coin: heads, you write book reviews for all the even numbered books in your tower; tails, you do the odds. The key here is not to show all your cards at the beginning. 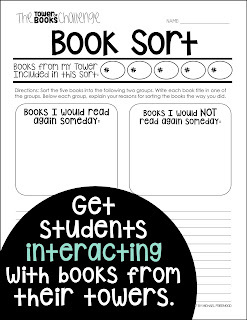 Informing students that they'll need to have really read their books, beginning to end, in order to complete these activities, is all you really want to tell students at the beginning. Leaving the details for later is important in preventing certain students from finding the loopholes. One engaging and not-super-time-consuming activity to throw in once or twice at any point in the challenge is a book sort. Maybe halfway through, when you know all students have completed a certain number books, ten for instance, have a book sort. (Some students may be well beyond ten books--that's okay!) You randomly choose five numbers within the minimum number of books completed and students use those books for the sort. For example, "Boys and girls, I want you to check your towers and use the books with the following numbers for the sort: #3, #5, #6, #9, and #10." Then have students sort these five books into two groups. You can have students determine how to sort them, or use the included sort, "Books I'd read again" and "Books I would not read again." Students then explain their reasoning behind sorting each book the way they did. 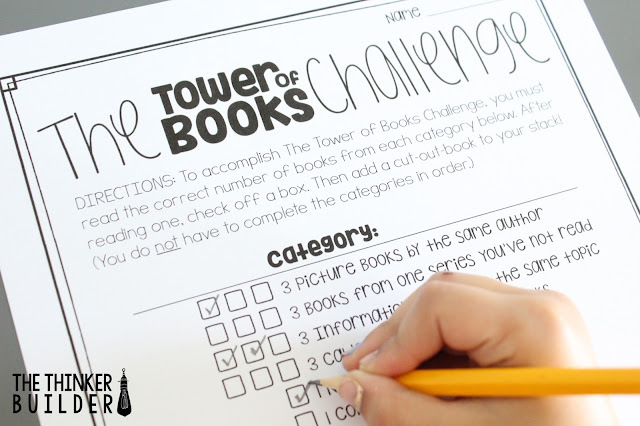 If you've already purchased The Tower of Books Challenge, be sure you've gotten the latest updates with the accountability and extension pages. You can do that by simply redownloading the resource from your "My Purchases" tab on TeachersPayTeachers. 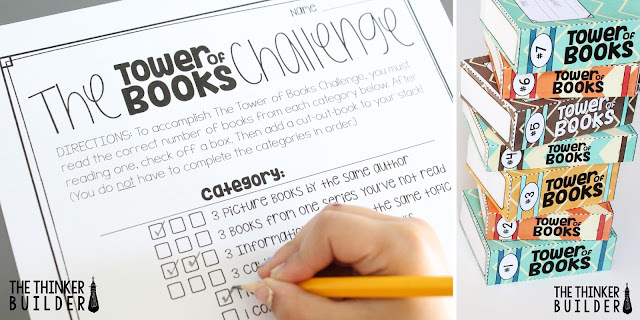 For details on purchasing The Tower of Books Challenge, click HERE or the image above. Now get to stackin' everybody!